This cake was created by our grandmothers and great grandmothers when times of war were wreaking havoc on our world. In some countries the Great Depression started in the late 1920s and lasted till the late 1930s. During this time food like dairy were scarce. Women had to come up with ways to feed their families off of $5 a week. This cake is called many things. Wacky cake, depression cake, grandma’s cake, boiled cake, boiled raisin cake, the list goes on and on. I will refer to it as depression cake, being this is where it originated from. This cake is safe for anyone with dairy allergies, because it has NO dairy! Wait, what?!? Yes that’s right, no eggs, milk or butter! It will still be very moist and filling! Because I wasn’t sure if our kids would enjoy the cake I made a half batch, but this recipe will be a full batch. My mother remembers eating this cake when she was a child. You can use pretty much any dried fruit you want, but the normal is raisins. This is a spiced cake. Soo I told my youngest, it’s like pumpkin bread without the pumpkin lol. This cake is most enjoyed with a cup of coffee, milk, a dusting of powdered sugar, or just plain. In a medium saucepan over med-high heat combine sugar, water, raisins, oil, and spices. Bring to a boil and continually stir for 3 mins. Remove from heat and let cool down 20 mins or so. You should be able to put your fingers it it before using it. In a small dish add 2 tsp. Warm water and dissolve salt and baking soda. In a medium bowl mix flour and baking powder. After raisins cool down, add your salt/soda mixture into the raisins. The batter may bubble a little. Next add wet mixture into dry and mix and stir until raisins are equally distributed. You may either grease a 9×9 pan or line with foil and leave an overhang on all sides. Pour batter into prepared pan and bake at 325* F for about 1 hour, or until a toothpick inserted in the middle comes out clean. After it’s done baking let rest for 5-10 mins and either flip upside down or use foil handles to remove and further cooling. I left mine sit too long after I flipped it and it has lines, but that does nothing to the flavor and the lines are not normal lol. Platano? 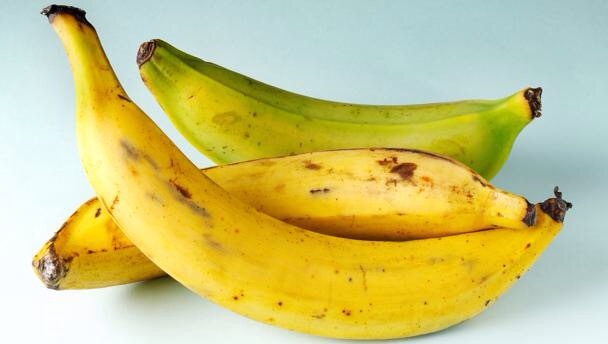 Plantain. A cooking banana, you can eat many different ways. In a lasagna type dish, as a side fried with salt, a side nicely sweetened. When their nice and bright green they make great chips! Or tostones, twice fried chips. Or maduro, when they turn darker in color almost going black, they are soo sweet! Down the international isle you can find a green bag of Goya plantain chips. Already fried, seasoned, and ready to go! Soo I’m going to cheat and use them, just adding more season the way we like! You will need 3 shallow containers that will easily fit the cutlets. In one dish put about a cup of flour seasoned with onion powder, adobo, and some garlic powder. In the next dish softly scramble 1 egg with milk and salt & pepper. Last dish mix crushed chips with oregano and more garlic powder. 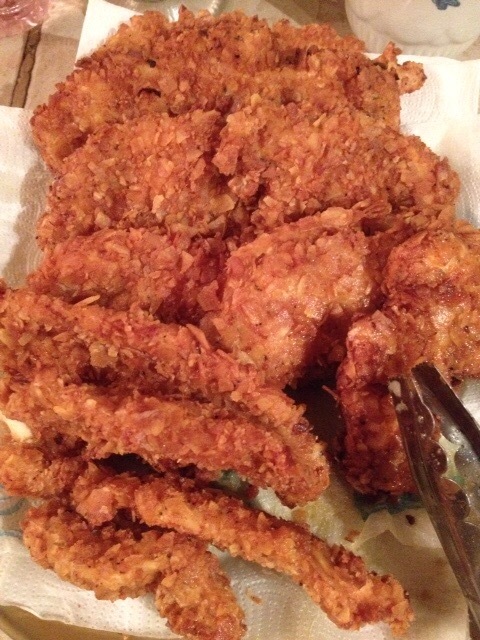 After you cut your breast into cutlets, wash the chicken with some white vinegar and water. I like to get two plates ready, one lined with napkins for cooked chicken and one for the battered raw chicken. 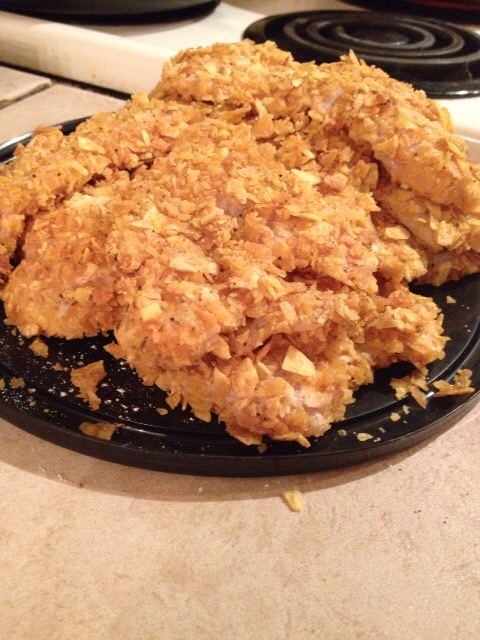 Take your chicken and drench in it flour, followed by the egg, last dipped heavily in the crushed chips. I batter all the chicken ahead of time while the oil is getting hot. Also after each batch of chicken I slightly raise the heat, it does cool down significantly. I use a medium then a medium high heat towards the end. Depending on how thick you cut your cutlets depends on how long their in. Usually about 3-4 mins on each side for thinly cut pieces. A golden brown color will also work. Or take the chicken out with thongs and slightly pierce with the tong to see if the inside is cooked. Beans, beans the magical fruit the more you eat the more you, better not! Sorry havin boys I couldn’t help myself, just not at the dinner table! We love our beans, we always have beans with our rice..it’s just the best way to go! In a medium saucepan add oil, denver mix, garlic, and recaito on med heat gently saute the veggies. Add in beans, and all seasonings raise heat to med high. Use the water to rinse the can to ensure you got every drop of juice into the saucepan. Bring to a slight boil, then reduce the heat to right under med and simmer for about 20 mins. In a medium saucepan add oil, denver mix, garlic, and recaito on med heat gently saute the veggies. Add Sazón and tomato sauce then stir, add in potato, and stir. Add in beans, and the rest of the seasonings raise heat to med high. Use the water to rinse the can to ensure you got every drop of juice into the saucepan. Bring to a slight boil, then reduce the heat to right under med and simmer for about 20 mins.or until the potatoes are soft. We don’t eat a variety of vegetables, I no..it’s horrible..we don’t eat healthy, we’re tryin tho! But until then, here are the main veggies we eat and how I ‘cook’ them. Add corn into a microwavable bowl, add butter and salt and pepper on top, mic. for about 2-3 mins, dependin on the power of your microwave. add-ins: some ham, onions, season all, etc. Add green beans into a microwavable bowl, add butter and salt and pepper, and season all mic. for 2-3 mins. dependin on the power of your microwave. If you want to add meat or onions you would drain the juice into a small saucepan add meat, onions, butter, and seasons. Simmer until you reach desired tenderness of onions add green beans, heat until warm. We don’t eat them often, but when we do it’s just a simple recipe..I don’t try new things because we don’t have them as often. Add peas into a microwavable bowl, add butter and salt and pepper on top, mic. for 2-3 mins. dependin on the power of your microwave. Add broccoli and water into a medium sauce pan with butter and salt and pepper cover with a lid and steam on med to med high heat for about 5-10 mins. dependin on your desired tenderness, Drain extra water and add cheese. Again, I am not talkin about minute rice! This is my version of Puerto Rican arroz amarillo. add-ins: ham, denver mix, gandules (little green peas), bacon pieces, beans, etc. In a large pot add water and all seasonin. If you are using add-ins you would want to saute the meat or veggies first with the oil called for, you can add the beans in with the seasons. Let the water come to a boil over med high heat. Before the water is boilin you would want to taste the seasoned water to make sure it is to your liking. Once the water is boilin add the oil and stir to break up the oil. Slowly add the rice while stirrin. It is very important that you stir the rice very thorough or you will have tie dyed rice lol tho it will taste good, it’s not the look were goin for. Bring the water and rice back to a boil, stir one more time just to make sure there isn’t any clumpin of rice. Cover the pot and lower the heat to low on a larger burner and med low on a small burner. If you lid doesn’t fit tightly, cover the pot with a layer of aluminum foil before you put the lid on. DO NOT touch the lid for at least 45 mins! When that time has passed, turn off the heat and use a fork to fluff the rice, cover and let sit another 5-10 mins. Enjoy! No, I am not talkin about minute rice, this is medium grain regular rice that requires time and proper measurin for the right end product! In a large pot add water and salt then bring to a boil at med high heat, stir until salt dissolves. Taste the water to see if it is salty enough for you, or if you think it will be too much don’t add all of the salt. Once the water is at a good boil add oil, stir to break up oil. Slowly add rice while stirrin. Once all rice is added, stir very well to reassure there is no large clumps of rice remainin. Bring back to boilin point, when you have a good boil goin give it one more stir, reduce heat to low on a large burner and med low on a small burner, cover and DO NOT touch for at least 45 mins! If your lid is not sealed tightly simply put a layer of aluminum foil between the pot and lid, squish the lid on tight. After 45 mins turn off the burner and remove the lid use a fork to fluff the rice then replace the lid and let sit another 5 -10 mins. Enjoy!